While today’s elite athletes train year-round, (see Manny Maxes-Out in Off Season) the winter months have always provided major leaguers with a much needed reprieve from the physical and mental challenges of 162 regular season games – not to mention the heightened emotions and stress of post-season playoffs. So it isn’t surprising that many MLB players spend time between seasons on movie/TV sets, recording studios and sharing the stage with Hollywood’s elite at award ceremonies. After all, they are the biggest stars in America’s Game. 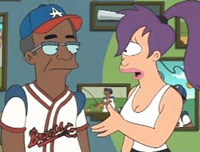 While Henry Aaron is known as one of the greatest gentlemen to ever play the game of baseball, his April 2002 appearance as himself (or rather Hank Aaron the 24th) on the outlandish cartoon comedy Futurama in an episode named “A Leela of Her Own” proved that he is without-a-doubt also one of the game’s best sports. In 2001 Hank played himself scouting for the Atlanta Braves organization in “Summer Catch,” a story about a rich girl (Jessica Biel) whose family summers on Cape Cod, where she has a romance with a local poor boy (Freddie Prinze, Jr.) who hopes to become a major league baseball player. 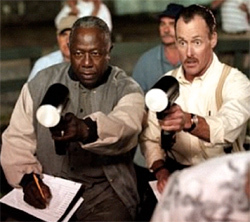 Other major leaguers, past and present, also had minor roles in the film, including fellow 500HRC member Ken Griffey, Jr. Prior to that, he starred in the show "The Remarkable Journey" (2000), appeared on "Arli$$: The Real Thing (1997), showed up in an episode of "Mr. Belvedere" (1989), and helped save the day on "MacGyver" in 1987. 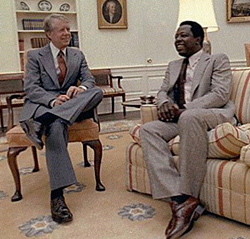 Before that he appeared with “The Fonz” on Happy Days (1980) and Jimmy Carter at his Inaugural Gala (1977). But his first TV appearance without a baseball bat in his hands came courtesy of "Captain Kangaroo" who invited “Hammerin’ Hank” to join him for a segment on July 20, 1957. In 1932 George Herman “Babe” Ruth became the first baseball star to make the cross over to a mainstream movie star. Check out this month’s 700 Home Run Club article “Ruth Loved The Babes” to see the Sultan of Swat starring in a series of short films called “Fancy Curves.” Somehow Ruth is roped into teaching the basics of baseball to a group of sorority girls, in order to help them beat the frat guys on the opposing team. The Bambino also appeared in a number of news reels, and even sang and danced his way through a 1937 movie entitled “Home Run on the Keys” – No Kidding! Like his contemporaries, Babe Ruth was one of the most sought after spokespersons for products and services. Here’s a look at just some of the ads that his famous mug appeared in. Willie also appeared with fellow 500 Home Run Club member Mickey Mantle on The Joe Namath Show on December 22, 1969. The October 14, 1972 ABC Saturday Superstar Movie “Willie Mays and the Say-Hey Kid” featured a guardian angel who offers to help a cartoon Willie Mays win the National League Pennant if he agrees to take care of an orphan girl. “The Commerce Comet” appeared in several TV ads for products ranging from Karo Syrup to Natural Light beer. "Suddenly Susan" (1999), "MacGyver" (1990), "Diff'rent Strokes" (1979), "Mr. Belvedere" (1989), "The Jeffersons" (1985) and "The Love Boat" (1979). During his playing days, “Mr. Cub” Ernie Banks entertained millions with his great skill and charismatic personality. So it’s no surprise that he went on to star on the big screen and television.